Buying baseball cards is not nearly as simple as it once was. Its easy to become completely overwhelmed by the sheer number of cards available on the market and since you are working with a finite budget its important to make every dollar count. The following 5 questions are designed to help you make good baseball card buying decisions regardless of how big, or little, your collecting budget might be. With a little practice, they'll become second nature in no time. Its worth noting that these strategies can be applied just as effectively to buying hockey cards, football cards, and other types of sports cards as they can be to buying baseball cards. 1. What is the book value of the baseball card in question? Check Beckett to see what the card books. Know the difference between High Book and Low Book. A great magazine for determining the value of graded cards is Beckett's “Graded Card and Investor Price Guide". It's the one Beckett I can't go without. 2. What is the condition of the baseball card? Is the autograph faded, smeared, or poorly signed? 3. Is it a parallel, reprint, or similar to any other cards? This question often goes out the window when impulse collides with the mythical “deal that's too good to be true". 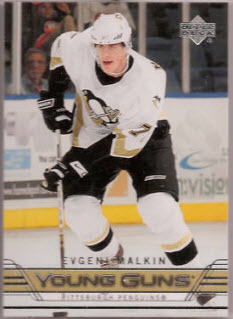 With less than 2 minutes remaining on an eBay auction we see an Evgeni Malkin Young Guns Rookie at $6.00 or perhaps it's at a card show. We open our wallets before thinking, only to later find out what we bought was actually a Checklist! Which one is a Malkin Young Gun and which is Young Check List? The one on the left is card #386, his $120 Young Guns Rookie, while the one on the right is card #495, his $8 Checklist! 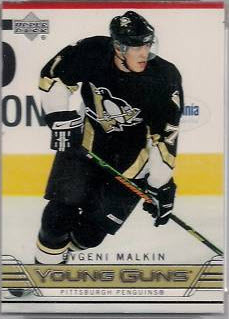 So remember, “The Lighter the Jersey the Better" when buying the Malkin Young Guns Rookie! The reprint rookie is another card that can easily fool you, especially online. Often a re-print is in amazing condition, far better than most of the originals. Upon first glance, you think your buying a BGS 9.5 rookie! Then when the card comes in the mail, it has 2006 on the back. Every re-print will have the actual year on back. Here's an example of one I recently came across. The one on the Right is a 2006 Re-Print rookie. The one on the left is his real Topps rookie. It's easy to tell them apart when you see them next to each other, but it can get hard when surfing eBay or at a card show. Notice, that the Gold is not imprinted on the card and the “Rookie Card" tag isn't present. 4. How will it fit into my overall baseball card collection? We all know how easy it is to splurge on cards. Cutting down on impulse buys is key in building your dream collection. Before buying any card, think about where it would fit into your collection. Is it a player you collect? Is it part of a set you are building? Would it be worthy of a team-bagged magnet case? 5. Is now the best time to buy this particular baseball card? This is the final question you should ask yourself before pulling the trigger on a purchase. Timing is everything when it comes to collecting. It determines how much you will pay and whether or not you will ever get the card. If it is an extremely rare card and a “must have" addition to your collection, maybe it's worth paying a little more. On the other hand, if there's a lot of the card in circulation, maybe you patiently wait until the price is just right. On eBay, prices go up and down based on performance and whether the sport is currently in season. Maybe you wait until your favorite player has a bad game until you buy. It is important to be mindful of supply and demand. Patience is a virtue in both real life and collecting.